No matter how well your fence was built, in time it will need some sort of repairs. Tree limbs falling caused by thunderstorms or snowstorms in Manassas, VA can damage your fence. Some storms even leave a fallen tree on top of your fence. This type of damage will definitely require a fence repair expert to come to your home in Manassas, VA to repair the damages. Depending on what type of fence you have will determine how your fence will need to be repaired. As beautiful and durable as wooden fences are over time these will start to rot. A wooden fence in Manassas, VA is hard to repair because it is hard to match the new wood to the existing wood. Wood fences will fade and turn gray in time making newer wood from the fence repair hard to stain to match the older wood. Depending on how much of a wooden fence needs to be repaired; it might be more feasible to replace the fence instead of trying to repair. Although vinyl fencing is durable, sometimes accidents in Manassas, VA can cause your fence to break. In cases like this, the whole section of fencing will need to be replaced and will not disturb its great looks. Over time, chain link fencing will rust. This type of fence repair is easily done by removing and replacing the rusted sections to restore its original beauty. Split rail fencing is usually used as a boundary fence. Fence repairs to this type of fencing are easy to replace and repair. These are one of the most popular fence styles for residential homes in Manassas, VA. Sometimes you might need to repair a fence gate. Gates begin to sag and might need new fence posts to make the gate even or other repairs such as the hinges or replacing the lock. 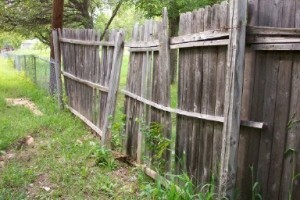 Most damaged fences in Manassas, VA can be repaired. It may take the help of an experienced fence repair professional so that the structure of your fence is not compromised. Should You Repair or Replace Your Wood Fence? While wood fences add beauty, value, function and privacy to your Northern Virginia yard, once you notice damage or deterioration it is important to repair or replace it as soon as possible. Aside from being unsightly, broken fences no longer perform their job. If the integrity of your fence is impaired it could let children or pets escape, allow other people or pests in, and it certainly compromises your privacy. If your fence is discolored, molding, rotting, splintering or falling apart it should be repaired if possible. Depending on the extent of the damage, it may need to be partially or completely replaced. While many people can repair fencing themselves, most of us don’t have the knowledge or tools to do the job. In either case, it’s best to have a professional fence company complete the repairs. A wood fence in areas like ours, with high humidity in the summer and freezing temperatures in winter, would also need to be periodically sealed from the elements to prolong its useful life. And do be aware that if sections of your fence are replaced, they will not exactly match your existing fence unless painted. Which brings us to our question: Should you repair or replace your wood fence? If you have a homeowners association or are planning to sell your home, you may be better off with a fence installation from a qualified fence contractor. Despite higher initial fence cost, many people with wood fences elect to install a composite or vinyl fence that has little maintenance requirements and does not need sealing or painting. So over time, you spend less money, your fence performs superbly, looks great, and you get to spend all that time you would have been repairing and maintaining your fence, doing something else you really love. Posted in Fences, repair fence | Comments Off on Should I Repair or Replace my Wood Fence? To Repair or Replace Your Vienna, VA Fence? The gate is perhaps the most-used component of the fence and that is the next place you should look in your determination. Hinges are typically a vulnerable point when it comes to fence gates. Hinges are usually easy to fix and once repaired the gate can simply be re-hung, restoring it to perfect working condition. The decision to repair or replace a fence should not be based on the fence gate. For more information on how to determine if you should repair or replace your Vienna, VA fence, call our professionals at Hal Co Fence to inspect the fence and give you guidance. Posted in repair fence | Comments Off on To Repair or Replace Your Vienna, VA Fence?